KATHMANDU, March 25: The government has designated Rs 393.4 billion in the budget allocation for the current fiscal year as 'climate-relevant according to the budget red book. But this whopping budget for climate resilient spending is said to be not realistic. The budget allocation in the 'climate relevant' category, which is a seven-fold increment in five years from Rs 53 billion in FY 2013/14, includes all money spent for reconstruction since 2015 and also the grants of Rs 225 billion disbursed for local levels. Putting all this in the same categorization basket has given a false impression that the government is becoming climate resilient. According to the Climate Change Budget Code endorsed by the National Planning Commission in 2012, climate relevant means that 20 to 60 percent of public spending for a given project comes under the categorization. 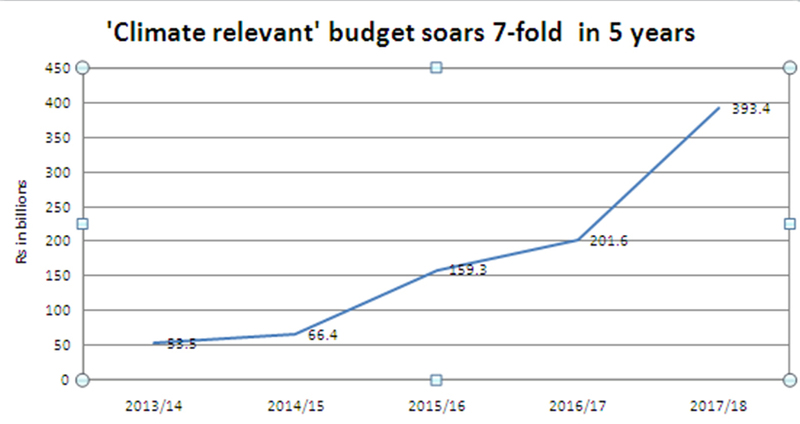 If such spending is over 60 percent it is 'highly relevant'. Experts and former bureaucrats agree that such haphazard categorization of the budget as climate resilient is not factual and may create a shallow impression. Gopi Nath Mainali, secretary at the Ministry of Agriculture, Land Management and Cooperatives, said it must be realistic. Mainali, who was a coordinator for writing the Climate Change Budget Code in 2012, was surprised to see in the budget for the current fiscal year a huge allocation figure categorized as climate relevant. "This coding should be applied objectively," added Mainali . The Climate Change Budget Code has categorized 11 types of activity, including sustainable management of natural resources and greenery promotion, land use planning, and climate resilient infrastructure, as climate change-related activities, implying that these are climate-relevant financing. UNDP has showcased Nepal's climate-relevent achievements at several public events and Nepal also earned a UN award in 2013. Bangladesh and Rwanda have been learning from Nepal. The budget coding initiative was carried out with the assistance of UNDP, and Mainali himself had led a five-member team to teach other countries such initiatives. Speaking at a program on public finance management on Friday, Policy Advisor for Freedom Forum Krishna Sapkota said, "This haphazard categorization of public spending as climate relevant or climate resilient has swelled and created a huge debate; everyone has been stressing the need to revisit the categorization." Experts give the analogy of defining all earthen road projects in rural areas implemented by the Department of Local Infrastructure Development and Agricultural Roads as gender friendly, and point out that this has no practical and rational ground. 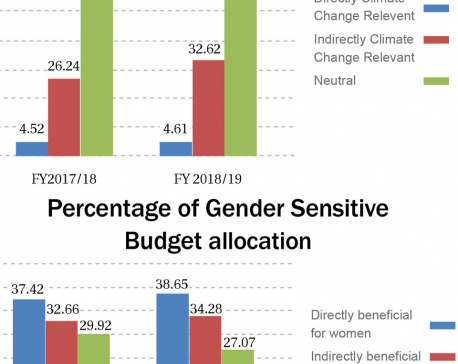 Gender-sensitive budget is another haphazard categorization by the Nepal government. Madhukar Upadhyaya, who was involved in mainstreaming climate finance in the national system with support from UNDP, also stressed the need for a rationale approach in categorizing budget allocations as climate resilient . "Nepal is a pioneer country in moving forward with climate change matters and also looking at all budget allocations with a climate change lens ," claimed Upadhyaya.